I had my sights set on the Colosseum this morning. (Commissioned by Emperor Vespasian in AD 72, it was intended to be built on the exact spot where Emperor Nero’s palace had stood. This was done in order to remove any connection between himself and that most evil of emperors.) Previously, I had walked about the iconic exterior of Il Colosseo but had never ventured inside. I was curious about the arena where the actual gladiatorial combats and wild animal fights occurred and I especially wanted to see where the mock sea battles were waged. (I’m fascinated by Roman waterways and plumbing – it is just incredible to me how they brought and used water in this city so long ago! Those aqueducts: wow.) After my cappuccino, I walked a little too far down Via Merulana and had to cut back over to the west to head toward the Colosseum. Getting lost like this is typical for me. 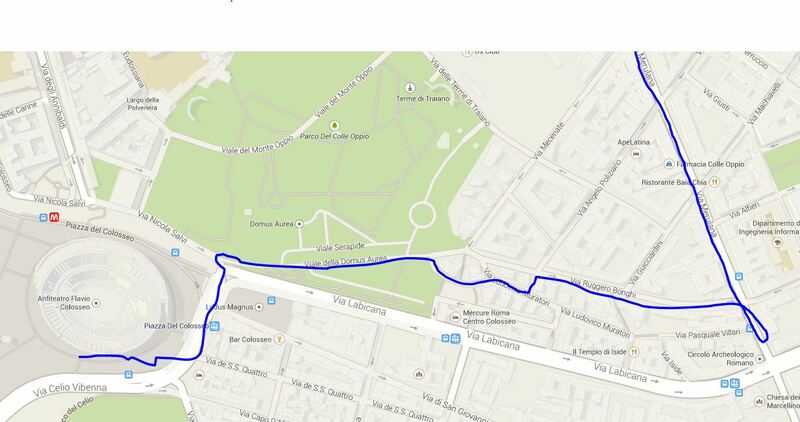 But, taking a circuitous route to Il Colosseo is actually quite apt, don’t you think? A circuitous route to arguably the grandest “Circle” in the world? led to the Colosseum, which was wonderful to just come upon like that. (I didn’t have a map with me this morning having forgotten it at my convent so I was wandering in what I thought was the general vicinity of the Colosseum. I like to do that sometimes. It make me feel like an explorer/adventurer! The Colosseum is so massive (capacity: 55,000 people) and impressive with its Doric, Ionic, and Corinthian columns. But my hopes of entering this time were quickly dashed again, as many – MANY – a soul (probably 55,000 or so) had the same idea. and wished for my forgotten hat (the one my brothers always tease me about and call “goofy”) because the sun was bright and was surely intensifying what I think are already pretty intense freckles and deepening the fine lines I’m beginning to notice around my mouth and at the corners of my eyes. But without a hat, I could only acquiesce and decided just this once, to lift my face to the sun and bask in its warmth and brightness, freckles and wrinkles be-damned. And I did get “frecklier.” And it was glorious. I headed to the entrance of the Palatine Hill and the Roman Forum, that auspicious former residence of emperors and aristocrats. Alas, the itching started up again as I saw the line of people stretching for meters along the sidewalk. I deferred yet again and walked along the perimeter which actually provided an excellent view of many of the ruins within. But not oggi (oh-gee) – today. Still, a walk along the perimeters of things can be a marvelous adventure. This entry was posted in Europe, Italy 2012 and tagged adventure, aqueduct, Arch of Constantine, Arco di Constantino, Augustus, Cicero, Colosseum, Corinthian columns, crowds, Doric columns, Emperor Nero, Emperor Vespasian, getting lost, gladiators, Il Colosseo, Ionic columns, Palatine Hill, poppies, Rome, Romulus and Remus, sunshine, Via Merulana, Viale della Domus Aurea. Bookmark the permalink. You know what I couldn’t help think of looking at these awesome picture? If that was here in, probably any place in America, it would be considered “dangerous”…not retrofit for earthquakes…and would be completely off limits if not torn down! Aah. Thanks so much for following along, my friend! I hope you’re doing well.